Dinoverse series by Scott Ciencin – Fred Patten’s book review. Here’s one for the scalies! Submitted by Fred Patten, Furry’s favorite historian and reviewer. This was originally written for Quentin Long’s Anthro Magazine. Dinoverse, by Scott Ciencin. Illustrated by Mike Fredericks. NYC, Random House, March 1999, hardcover 0-679-88842-X $18.00 (282 [+ 8] pages). Dinoverse: I Was a Teenage T. Rex, by Scott Ciencin. Illustrated by Mike Fredericks. NYC, Random House, March 2000, paperback 0-679-88843-8 $4.99 (177 [+ 8] pages). Dinoverse: The Teens Time Forgot, by Scott Ciencin. Illustrated by Mike Fredericks. NYC, Random House, March 2000, paperback 0-679-88844-6 $4.99 (179 [+ 3] pages). Dinoverse: Raptor Without a Cause, by Scott Ciencin. Illustrated by Mike Fredericks. NYC, Random House, May 2000, paperback 0-679-88845-4 $4.99 (180 [+ 12] pages). 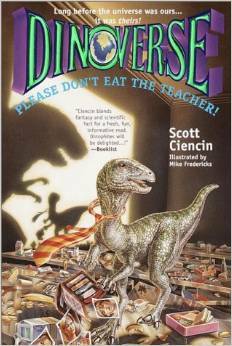 Dinoverse: Please Don’t Eat the Teacher!, by Scott Ciencin. Illustrated by Mike Fredericks. NYC, Random House, July 2000, paperback 0-679-88846-2 $4.99 (194 [+ 12] pages). 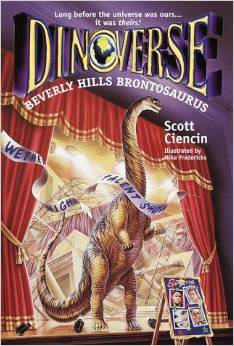 Dinoverse: Beverly Hills Brontosaurus, by Scott Ciencin. Illustrated by Mike Fredericks. NYC, Random House, September 2000, paperback 0-375-80595-8 $4.99 (173 [+ 11] pages). 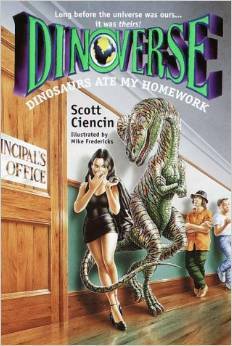 Dinoverse: Dinosaurs Ate My Homework, by Scott Ciencin. Illustrated by Mike Fredericks. NYC, Random House, November 2000, paperback 0-375-80596-6 $4.99 (192 [+ 8] pages). 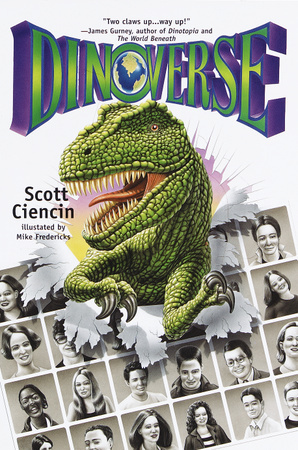 If there is an expert in writing s-f Young Adult novels featuring dinosaurs, it is Scott Ciencin. He has written seven authorized Dinotopia novels, four authorized Godzilla novels, and four authorized Jurassic Park novels. (Not to mention a slew of Batman, Buffy the Vampire Slayer, Charmed, The Elven Ways, Forgotten Realms, Kim Possible, Star Trek, Transformers, Zorro, and other authorized Young Adult series novels.) But there is one series that is all his own creation: Dinoverse. Dinoverse began with a “real novel” in March 1999. It was an $18.00 standalone hardcover, illustrated by Mike Fredericks. It got favorable reviews in the book and library trade as an imaginatively humorous sugar-coated paleontology lesson for upper preadolescents and younger teenagers. A year later, spread out over 2000, it was followed up by six Dinoverse Young Adult paperbacks, all written by Ciencin and illustrated by Fredericks. These were a continuation of Dinoverse’s light but serious paleontology lessons, but presented under more humorous titles and covers (all by Adrian Chesterman) like Raptor Without a Cause and Please Don’t Eat the Teacher! ; evolving into the teenagers facing an interdimensional invasion by sapient dinosaurs. An independent novel followed by its own “authorized follow-ups”. That’s imagination! Dinoverse starts at Wetherford, Montana’s Wetherford Junior High, where eighth-grader Bertram Phillips is preparing for its science fair. Bertram, a stereotypically socially awkward, shy, plump, thick-gasses-wearing, picked-on brainy geek, is introduced alongside several classmates, notably Mike Peterefsky, a friendly football star who is Bertram’s best friend and protector; Candayce Chambers, the beautiful but cruel prom queen who makes cutting put-downs of other girls to her clique; and Janine Farehouse, a plain girl who is the school’s most notorious attention-getting troublemaker. Bertram considers his M.I.N.D. Machine a big, flashy “magic trick” that looks awesome with all of its blinking lights, but does not do anything. For good luck, he puts his genuine small T. rex bone keepsake from his paleontologist father inside it. The next thing that Bertram knows, his mind is in South Dakota 67 million years in the past, in the body of an Ankylosaurus fighting off a Tyrannosaurus rex. The host body is operating on instinct, but Bertram’s mind can override those instincts. Bertram escapes from that T. rex but almost immediately encounters an even bigger one – inhabited by his friend Mike’s mind. They can “talk” by telepathy. “Mike felt a sudden rumbling inside him. A low growl came from his stomach. He was hungry. Without thinking, he took a step toward the writhing hot lunch before him and opened his gigantic, razor-lined maw. 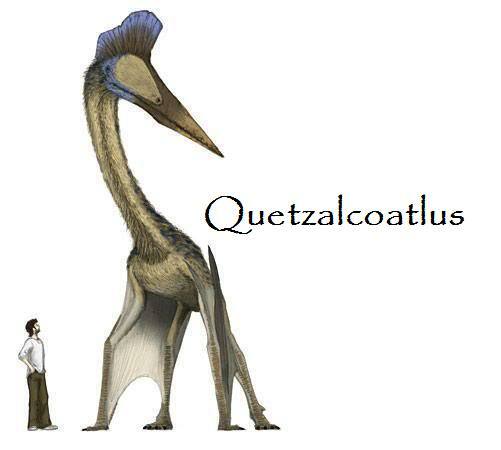 And Janine is a Quetzalcoatlus, which she thinks at first is a Pterodactyl but Bertram, who is an expert on dinosaurs because of his paleontologist father, corrects her. The four teen-controlled dinosaurs have just come together and are wondering what to do next when they are mind-contacted by Mr. London, not from the science fair but from sixty years in the future. He has spent his life trying to contact the teen’s minds in the past. (Their 20th-century bodies are in lifelong comas.) Mr. London’s cut-off message is that they have ten to twelve days to find the hilltop that he shows them, where “the Standing Stones” are, to get back home. Most of Dinoverse is their adventures trekking toward the hilltop. Three of them meet other dinos of their species who want to accompany them: a female Ankylosaurus (“Beanie”) who becomes Bertram’s jealous mate; a male Quetzalcoatlus whom Janine names Loki who appoints himself her protector; and Moriarty, another T. rex who sees Mike as a rival and becomes an insane enemy. Candyce tries to fashion clothing for herself out of big leaves, and becomes such an odd sight that other Leptoceratopses adopt her as a herd leader. Bertram is reminded the hard way that Ankylosauruses (Ankylosaurii?) are herbivores, and just like large 20th century herbivores, they fart really noisy, stinky farts a lot. Because of their 20th century social problems, Bertram and Janine seriously consider giving up the future and remaining as dinosaurs. Most of the adventure is written as a series of cliffhangers. A chapter will focus upon one character until he or she gets into a desperate situation, then switch to another character. “Tendrils of light burst up from the floor. They struck two students ahead of him, a boy and a girl he hardly knew. They shouted, then sank to the floor. Others screamed. Bertram ran from the classroom, rocketed down the stairs, one flight after another. There are six pages of an illustrated dinosaur glossary and references following the story. Mike Fredericks has done two dozen line drawings of dinos; over half illustrating scenes from the story and eight of particular types of dinosaurs. The ending seems to promise a sequel. But what came a year later was an apparent paperback reprint with a new subtitle: I Was a Teenage T. Rex. This was in fact the first book of the new series, reusing Chesterman’s Dinoverse cover. I Was a Teenage T. Rex and The Teens Time Forgot divided Dinoverse between them, with the division between Chapters 17 and 18 of Dinoverse. Since a 282-page story does not divide into a 177-page book and a 179-page book, even though the paperbacks have smaller pages and much larger type, the two new versions are rewritten and padded; but the plots are the same. With Dinoverse #3, Raptor Without a Cause, Ciencin began the new story. Mr. London’s fiddling with the M.I.N.D. Machine reactivates it, and he and three new students are sent into mid-Cretaceous-era dinosaur bodies. Will Reilly, one of Wetherford Junior High’s movers and shakers – he has just lost an election for Class President and is trying to think of new ideas to regain the limelight – becomes a Deinonychus. The omega member of a pack of Deinonychii, in fact. The previous M.I.N.D. Machine malfunction only affected the lives of four students. The new one will change the past and wipe out the present (or turn it into an unrecognizable timeline), unless Will can “fix” it. Patience McCray, Wetherford’s star basketball player, is an Acrocanthosaurus, which looks roughly like a Tyrannosaurus. Mr. London has become a lizardlike Hypsilophodon. His instincts as a tiny prey animal are to run and hide from everything. Zane McInerney, the school fall guy/clown, is now a brontosaurus – with a tagalong bronto baby brother. Will alone, and Patience, Mr. London, and Zane (with Runt) have adventures singly and together as they use their human intelligence with their dinosaur instincts to find the “amber key” and bring it to where the “something big” is due to happen. Raptor Without a Cause ends on a cliffhanger. Dinoverse #4, Pl ease Don’t Eat the Teacher!, completes the two-part middle adventure of the series. 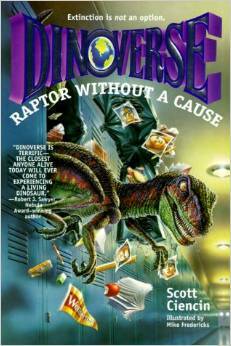 But it begins with a Prologue telling that, while Will’s, Patience’s, Zane’s, and Mr. London’s minds have been sent into dinosaur bodies 112 million years ago, five other Wetherford Junior High students have transformed into dinosaurs in the present and are apparently trying to eat Bertram Phillips. Bob London stops letting his Hypsilophodon instincts make him terrified of all the bigger dinosaurs; but first he has to rejoin Patience and Zane, after he becomes the leader of four other “Hippies” fleeing from carnivorous Microvenators. Will, a Deinonychus, has to fight a rival Deinonychus he names Hook who keeps trying to kill him; then teach Hook to accept him as a brother. At one point Will fashions a torch to referee a fight between Hook and a Tenontosaurus. Zane, a brontosaurus (actually a Pleurocoelus, “brontosaur” being its popular name around Texas where it is the state dinosaur – Dinoverse is sugar-coated education, remember; it looked like the more popular Apatosaurus “brontosaur” that lived much earlier and farther north), and Patience are sidetracked by having to fetch Runt who wanders off. After Mr. London, Patience & Zane, and Will are all reunited and march off to find “Ground Zero”, Patience is horrified to find herself falling in love with another Acrocanthosarus whom she names G.K. (for Green Knight). Ground Zero turns out to be a hilly area riddled with fissures and the odor of natural gas escaping. They sense that they are supposed to keep the past from changing by saving one particular dinosaur from being killed in the coming natural gas explosion – but which? “Farther down the hall, bearing to the left, he [Bertram] saw a pair of Nanotyrannus chasing a young, blond, female student. The ceiling splintered directly above them and an Ankylosaurus fell through, pinning the smaller dinosaurs in place. In Dinoverse #5, Beverly Hills Brontosaurus, set in Beverly Hills, California 150 million years ago – on the California coast, with active volcanoes — a lot was different, and the plot went off into both alternate-universe awesomeness and pure silliness. “The machine sat mashed into the ground, its shiny aluminum sides dented, its struts cracked, and all but two of its monitors shattered. Cables dangled from its ten-foot-long frame while bent or broken circuit boards drooped from its six-foot-high surface. A busted-up leather chair sat in its center, along with a keyboard dangling from one twisted arm. Claire DeLacey – “Crystal Claire”, a soft blonde whose parents have pushed her into becoming a child actress starring in dainty and sweet roles – is tired of everybody treating her as though she is going to shatter. When she becomes a giant scissor-jawed predator “that hadn’t yet been named” (Carcharodontosaurus), she claims to be Holly Cronk, the toughest girl in school. “What was looking his way wasn’t a dinosaur. Not exactly. ‘I say, are you lost?’ the figure asked. Will stared at the strange being who had spoken. It had a saurian snout, green and pink scales, tiny teeth, and an almost-human-looking skull. It wore a red robe adorned with an elegant black pattern, and black cushioned sandals protected the soles of its feet. Bertram convinces them that the only way to succeed is for all of them to work together. But J.D. Harms sneers at the idea of cooperating. He likes being a lone, big dinosaur – and if that dooms all the others to remain trapped in dino bodies, and the future to become a Dinoverse, tough for them! The dino teens get laid back. Party! While each of the key cast — Bertram, Claire, J.D., and Aaron – have chapters showing their personal development, the others chill out with a beach party. Dino surfers! The last part of the novel concentrates upon the four main characters as Bertram leads the other twenty-nine dino/students in carrying the M.I.N.D. Machine to safely; Claire and Aaron go after four of the group who have gotten separated; and J.D. plots to sabotage everyone. Cliffhanger! “He turned around and saw a swirling black space behind him. The vortex was a door. He’d found a door between the past and the present! Only – he was still a dinosaur! A switch was thrown and blinding light filled the gym. Aaron saw that he wasn’t alone. Dozens of dinosaurs stood about him, circling him warily. Others sat on the bleachers, looking on with gnashing teeth and clicking claws as a trio of raptors approached. The dinosaurs awaiting Aaron are from a third timeline, manipulating the dimensions to make sure that their reality becomes dominant and that the realities of mammals, the Dinoverse, and a myriad of others fade away. In the dinosaur age, J.D. is confronted by Jae’Dee. Everything rushes to a dazzling and confusing, but satisfactory, conclusion. When a novel/series begins with four young teenagers becoming talking dinosaurs millions of years in the past, and keeps building for six volumes, it has to end spectacularly. The sugar-coated paleontology is often briefly overwhelmed by silliness, such as the dinosaurian food fight in the school’s cafeteria in Dinosaurs Ate My Homework; but on the whole, the we’re dinosaurs; what do we do now? light adventure is pleasant reading. I wrote this review of the “Dinoverse” series several years ago for Cubist’s Anthro website, but it was shut down before he could publish it, so it’s “new” here. Unfortunately, Scott Ciencin died this August, so he never saw it. Fred thanks for introducing me to these. Sorry to hear about Scott though. This was a wonderful write up.